The animal kingdom is known for its fierce hierarchy and merciless predators. But sometimes, unlikely events arise when you least expect it. How often do we see friendships span across the species in adorable displays of playfulness, and pure, untainted love? This post is dedicated to animal lovers who believe that species differences are only skin deep. This viral image has graced the web with undeniable cuteness. Tigers, often noted for their unrelenting strength, are rarely found with orangutans. 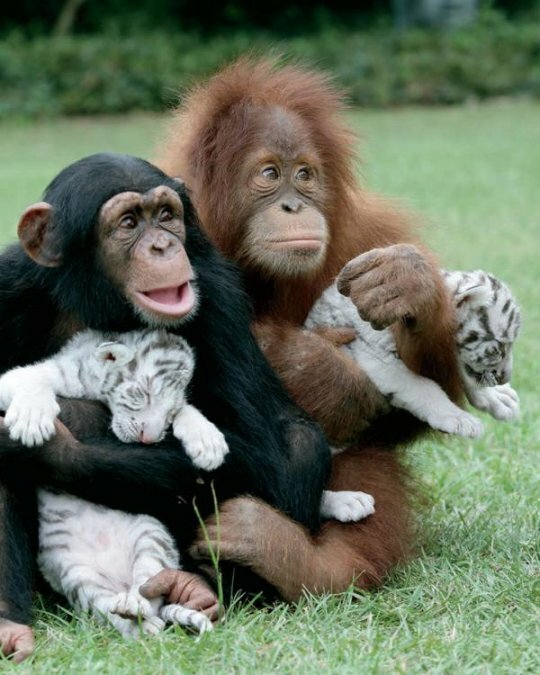 But in a surprising turn of events, this Orangutan took on a maternal role for two orphaned, baby white tigers. Clearly, this gentle giant could not resist the effortless charm of these feisty felines. When Forbi the owl first set her effervescent eyes on Cleo the Cat, it was love at first sight. They forged an enduring friendship that was as adorable as it was genuine. Miraculously, Cleo has suppressed her instinctive taste for avian delights and treated Forbi with the utmost respect. Size has never been a socially isolating barrier for Themba the elephant. At only six months of age, Themba's mother died from a traumatic cliff fall, and he was left with no mother to care for him. 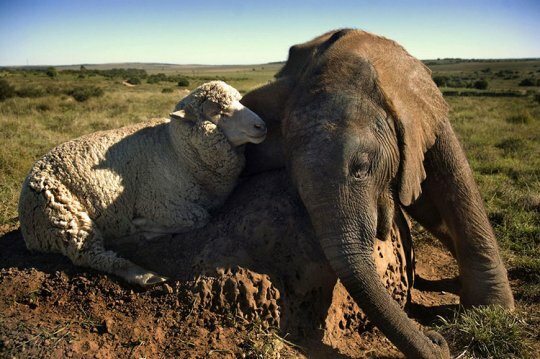 One day, while exploring, he stumbled upon a sheep named Albert, and inexplicably, they bonded. In fact, their relationship is so remarkable that Themba mimics Albert’s behavior and diet’s, as well. Canines and felines are often noted for their unflinching rivalries, which have endured throughout time. 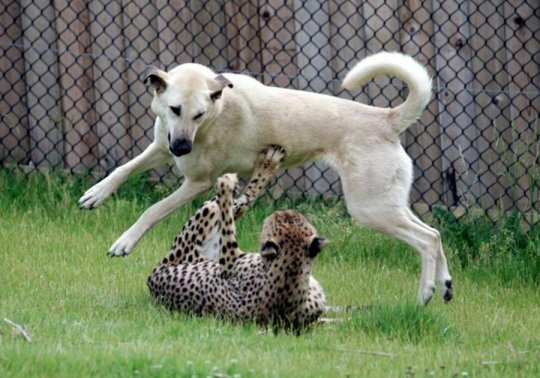 This observation does not apply to the cheetah and Anatolian shepherd featured in this photo. 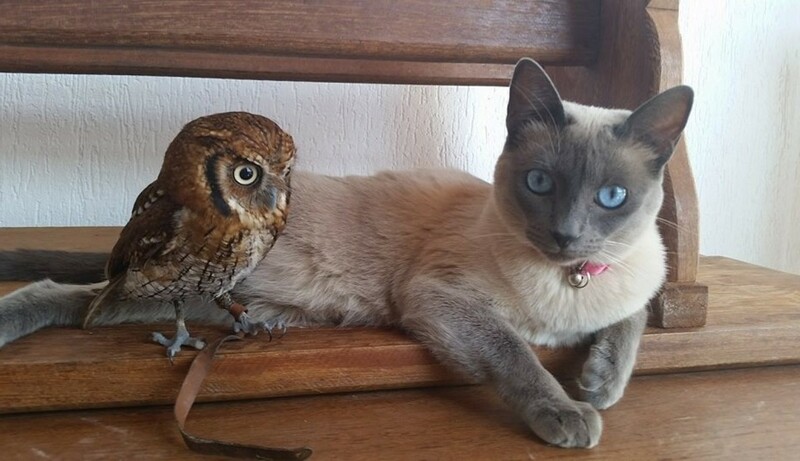 Both of these beautiful animals were adopted at only 2 months, and they have cultivated a friendship ever since. Canine and feline rivalries occupy no place in their remarkable friendship. 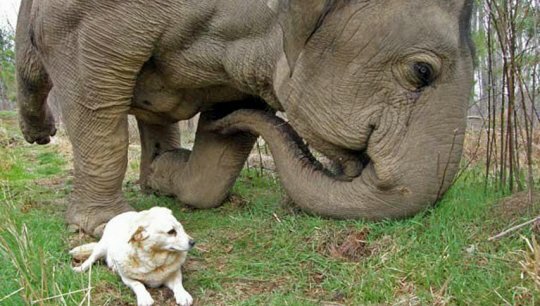 Apparently, elephants have a natural penchant for both sheep and dog, as noted in this story about Tarra the elephant and Bella the dog. For a total of eight years, Tarra and Bella have nurtured a bond of unfathomable friendship. In fact, Tarra would often stroke Bella’s stomach with her foot. Both Tarra and Bella are well aware of the fact that they are not elephants or dogs, respectively. But this has never obstructed their affectionate bond in any capacity. 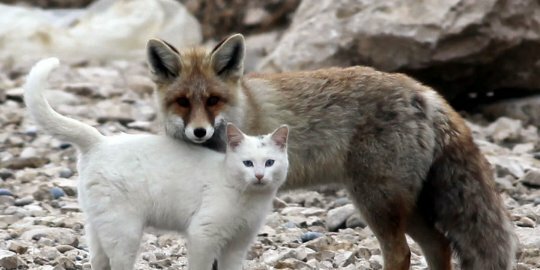 No one would ever envision an innocent camaraderie between a fox and a cat. In fact, each of these animals has garnered a reputation for being spirited, in terms of their predatory needs. The cat and fox in this photo are featured playing and fostering an unlikely friendship. The bizarre nature of these friendships suggests that beneath the survival-driven tendencies of the animal world, there is an innate need for nurturance and affection. 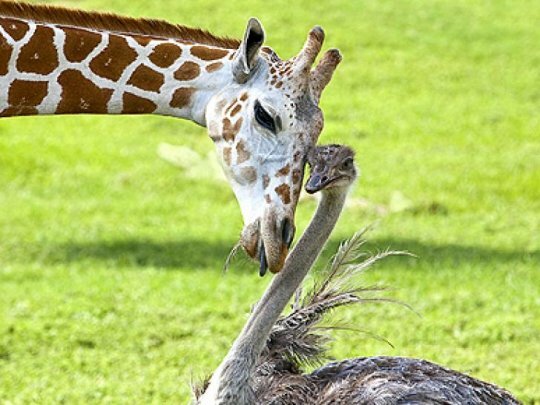 When Bea the giraffe and Wilma the Ostrich first met in the Serengeti Plain exhibit, they explored the joys and delights of friendship, in spite of their noticeable height differences. Primates of all sorts and canines are believed to be among the most intelligent animals on the globe. 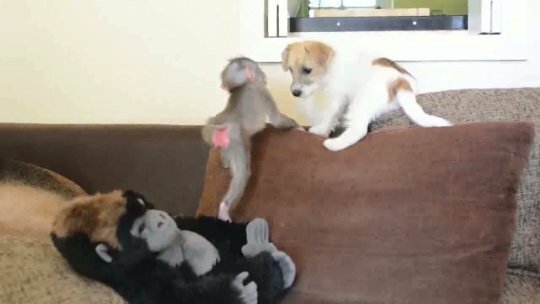 Hence, it is no surprise that Muby the monkey made friends with a Jack Russell terrier.